Hi everyone, welcome to the final week of my Design Team Series, using the Quirky Critters Stamp Set. For this weeks project I added a couple of other stamp sets into the mix to show that you don't have to just stick to one set or suite. 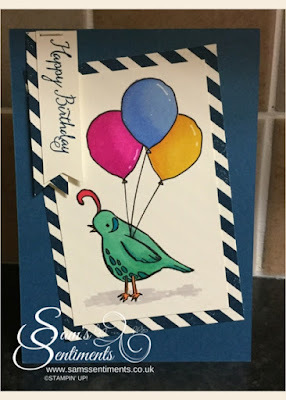 I used the balloons from 'Balloon Celebration' and the 'Diagonal Stripe' background stamp. I used alcohol markers from my non-Stampin' Up! stash to colour the bird and balloons, I then coated the balloons with a layer of Wink of Stellar to give them some shine! Thanks very much for joining me again today, I have listed all of the products used below.